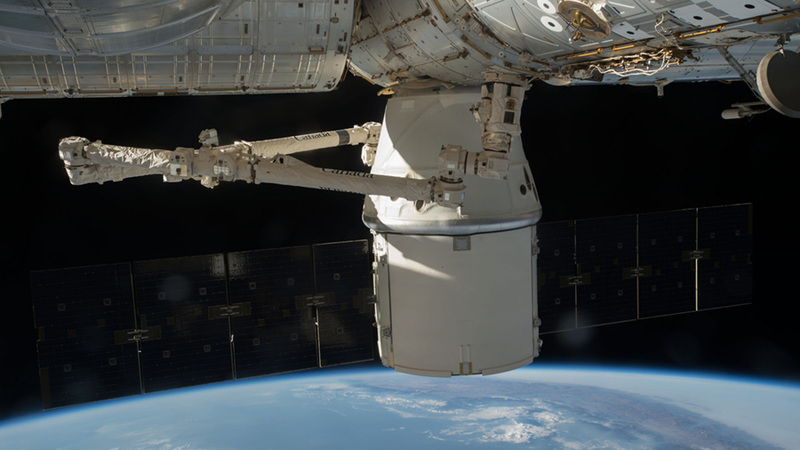 The SpaceX Dragon resupply ship is pictured attached to the Harmony module a few days after its arrival in July. The SpaceX Dragon resupply ship is getting ready to return to Earth Friday morning loaded with gear and a variety of science for analysis. Another spacecraft, the Soyuz TMA-20M, will leave Sept. 6 and land in Kazakhstan with three International Space Station crew members. Dragon delivered numerous science experiments July 20 that the Expedition 48 crew immediately unloaded and began working on. Two of those experiments set to return on Friday include the Heart Cells study and Mouse Epigenetics. That research explored how microgravity affects human heart cells and alters gene expression and DNA in mice. The station will get an orbital reboost early Wednesday when the docked Progress 63 cargo craft fires its engines for over 12 minutes. The reboost will put the station at the correct altitude for the departure of the Expedition 48 trio next month. Expedition 48 Commander Jeff Williams and cosmonauts Oleg Skripochka and Alexey Ovchinin will return to Earth in two weeks after 5-1/2 months in space. Williams will be completing his fourth space mission and hold the NASA record for cumulative days in space. Skripochka will be completing his second mission and Ovchinin will be completing his first.